Due September 13 via ECW press, the project sees Peart capture his thoughts and share tales from what appears to be the band’s final tour. “Thirty-five concerts. 17,000 motorcycle miles. Three months. One lifetime,” reads the book description. “In May 2015, the veteran Canadian rock trio Rush embarked on their fortieth anniversary tour, R40. For the band and their fans, R40 was a celebration and, perhaps, a farewell. 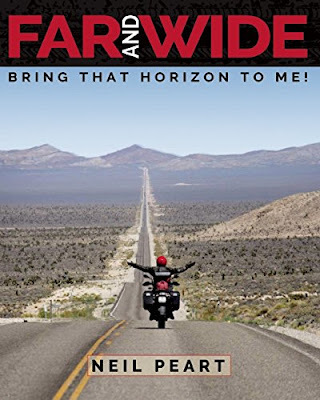 But for Neil Peart, each tour is more than just a string of concerts, it’s an opportunity to explore backroads near and far on his BMW motorcycle. “So if this was to be the last tour and the last great adventure, he decided it would have to be the best one, onstage and off. “This third volume in Peart’s illustrated travel series – following 2011’s “Far And Away: A Prize Every Time” and 2014’s “Far And Near: On Days Like These” – shares all-new tales that transport the reader across North America and through memories of fifty years of playing drums. From the scenic grandeur of the American West to a peaceful lake in Quebec’s Laurentian Mountains to the mean streets of Midtown Los Angeles, each story is shared in an intimate narrative voice that has won the hearts of many readers. Rush also documented the 2015 tour with “R40 Live”, a live recording that captures the group in concert in their hometown of Toronto over two nights last June. During the 40th anniversary run, bassist Geddy Lee discussed Rush’s plans to scale back the length of touring as band members approach their mid-60s in the next few years, with Peart wishing to spend more time at home with his family in California. "It's most likely our last tour," said Lee. "I couldn't put it any more accurately. I can't say for sure. But it doesn’t mean we don't want to work together still, it doesn't mean we won't do another creative project and I've got ideas for shows we could do that don't involve a tour." Rush were inducted into the Rock and Roll Hall of Fame in 2013.